Today I am grateful for … Change! Yes, really, I said it. I actually fear change, don’t really like it much when things I’m accustomed to are turned around or when life deals us a blow and what we know as ‘normal’ is no longer. “Change”, for me, is daunting at best, shocking at worst – but usually with change comes hope and new possibilities. The older I get the more readily I embrace change and find it easier to adapt to shifting circumstances. Change brings with it growth and transformation – in life and in the garden. Not all change is intimidating - (although the freezing temperatures experienced by gardeners in the Northern Hemisphere would intimidate this gardener no end …). The good side of change? With the changing of seasons comes new growth and new opportunities for gardening, new beds to prepare, garden beds to change … For this I am grateful. Photo: Gardenia – I’m showing Gardenias as my “Flower of the Day” today, because … well these are going to CHANGE!! This is The One and Only decent photograph I’ve ever been able to take of a Gardenia as they have been a huge dissapointment to me. The eight Gardenis shrubs that were planted in my garden three years ago almost put me off gardening altogether. They are fussy, hard work and (in my experience) for minimal return. They were the only plants I took care of pre-2011 (the year I started gardening”) and they have seriously had everything go wrong with them. Of the eight shrubs I had, five remain – and they are not great. The others fell victim to who-knows-what. I would say they are in the wrong location – except they were planted by a Professional Landscape Designer. You would think they would get it right? No disrespect – some of my favourite people are landscape designers – but I’m guessing this guy didn’t do his homework. So the Gardenias are on borrowed time in my garden… If they don’t flower or do something magical this year then … I’ve had not a single bloom in the last 18 months, and before that, the blooms lasted what seemed like an hour, then fell off. The leaves turn yellow, they get eaten by all sorts of critters and generally they just look poorly. I’ve honestly tried everything with them – except pulling them out – thats next! 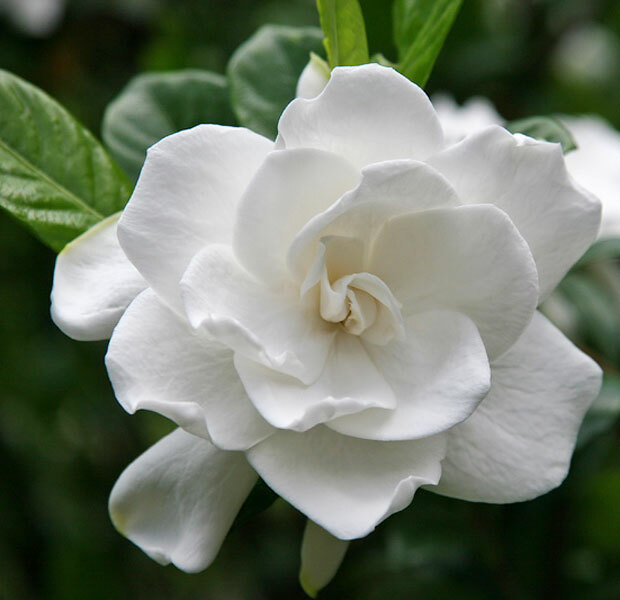 Gardenias Jasminoides – (Mine are Gardenia Jasminoides) – Gardenia jasminoides, (common gardenia, cape jasmine or cape jessamine) is a fragrant flowering evergreen tropical plant, a favorite in gardens worldwide. With its shiny green leaves and fragrant white summer flowers, it is widely used in gardens in warm temperate and subtropical climates. It has been in cultivation in China for at least a thousand years, and was introduced to English gardens in the mid 18th century. Many varieties have been bred for horticulture, with low growing, and large- and long flowering forms. Haha, just found this on Wikipedia: Gardenia jasminoides is generally considered to be somewhat difficult to take care of. I love this post – it is one of the things I too am grateful for. Change is good! Even when it is from lessons learned. We can only grow to better people when we can embrace change. Thank you for writing it so beautifully! I see 3 indigenous gardenias over at PlantZAfrica. If it was particularly that sort of white flower you asked for? That was three years ago, now I don’t let anyone tell me what i should have anymore, so if a plant doesn’t do well, it’s my own mistake. I’m going to try feeding them again, compost, mulch… Give them one last good effort and see if I can turn it around. I’ve read up and Keith Kirsten says they tolerate sun, so it can’t be that. It must then be something I am doing (or not doing). So I will give it another try, but pot the two worst ones. Christine: trouble plants are often not worth the effort. Before getting rid of these completely, try putting one into a pot that you can move around and experiment with. Then yank out the rest and don’t look back! I’d also suggest letting your landscape designer know (in a nice way!) that you weren’t happy with that plant as it was too difficult to take care of and never did well. It may help influence his decision to stop using it in more designs and disappointing more customers. HI Alan, that’s very good advice, thank you – I hadn’t thought of putting them in pots. I think I will do that with one or two to start with and move them around. I did tell the landscaper – he promised to come and look, we never saw or heard from him again. His loss. I forgive mistakes, but I don’t tolerate poor service. On the up side, not all he did was bad – he planted the azaleas I love every autumn and winter, so that was good.